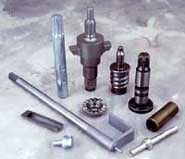 APEX FASTENERS provides complete design support for your products needs. APEX FASTENERS supports AutoCad enabling us to integrate fully into your design environment. Bring us the concept and let us help you bring your ideas to completion. While part geometry affects tolerances, cold forming generally allows your tight tolerance requirements to be met. When combined with secondary grinding operations, tolerances as tight as .0127mm (.0005") can be achieved. The diameter (top) and length (bottom) tolerances shown here can be achieved without secondary machining. If the application requires a sharp fillet radii, corner or flush surface, an undercut can be achieved in the cold forming process, possibly eliminating a secondary operation. Generous radii at the corners allow the natural flow of material to strengthen the part and reduce the need for secondary machining. If necessary, tight or zero radius corners are possible through secondary machining. Points can be achieved by heading or secondary operations. The reference dimension for a header die point is 45º after threading. Other point designs can be formed with secondary machining. A variety of shapes can be extruded through cold forming, allowing area reductions of 90% in aluminum, 75% in medium carbon steels, and 50% in stainless steels and high tech alloys. Cold forming produces a surface finish of 63 micro inches, which is superior to the 125 micro inch finish typically produced on machined surfaces. If a smoother surface is required, Apex Fasteners can utilize grinding, burnishing, or other secondary operations to achieve a finish as low as 6 micro inches. Cold forming can produce many unique head styles, including large, offset, functional and decorative head designs, without secondary operations. Also, cold forming can efficiently manufacture a variety of internal and external drive systems, including slotted, phillips, torx, slot.torx, slot.phillips, one way, tamper resistant, phillips posidrive, square drive and others. Cold forming allows the cost-effective manufacturing of shoulders in shapes such as round, triangular, hex and more. In selecting plating, several aspects must be considered, including desired corrosion resistance, lubricity and appearance, as well as concerns over cost and toxicity. 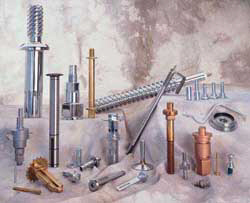 While typical plating offerings include zinc, organics, and phosphate and oil, Apex Fasteners has a wide array of plating types available to meet the specific needs of your application. Please contact a Apex Fasteners for more information on what type of heat treatment is appropriate for your application.